"The villagers came first, and then the Naxalites, dressed in black. They were some 300 Naxalites, all wearing black," a jawan of the Central Reserve Police Force said. The jawan was among those injured in the Naxalite attack that took 25 lives in Chhattisgarh on Monday. Some of the Maoists carried rocket launchers, the jawan, who did not wish to be named, said. Another injured jawan, Sher Mohammad Khan, told PTI the Naxalites also carried AK-47s, SLRs and other automatic weapons. 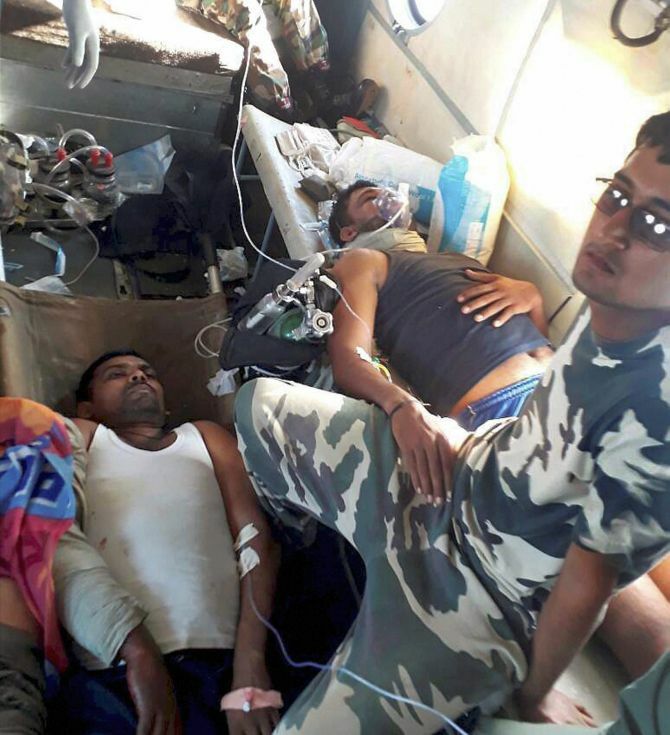 The two men, who were in a 99-strong CRPF team carrying out a sanitisation exercise for an under-construction road in Chhattisgarh, are now being treated in a hospital in Raipur. "They first sent the villagers to check our location. The villagers weren't carrying arms, (so) how could we fire at them," the unnamed CRPF man asked. "We retaliated. We also killed many Naxals," he added. Khan said there were women in the group of Naxalites that attacked the CRPF team in Sukma. Sukma is a part of south Bastar, which has for decades been battling the guerrillas. Since April 2010, nearly 200 security personnel have died in six major attacks in Chhattisgarh. "I request Prime Minister Narendra Modi and Home minister Rajnath Singh to grant us the Power Act in this area to deal with the Naxal menace," Khan said, referring to the Armed Forces (Special Powers) Acts or AFSPA, in force in some troubled parts of the country. The controversial act gives sweeping powers, such as the right to shoot at sight, to the forces. The government promised to review its strategy on battling Naxalites, as Chhattisgarh chief minister Raman Singh warned that an operation would be launched "with more firmness" and "vigour" against the guerrillas in the coming days. Shaken by the audacious attack, the Centre and the state government made it clear that they would strike back in equal measure. Most telling were the comments by Home minister Singh, who rushed to Chhattisgarh capital Raipur this morning. "The sacrifice of our brave jawans will not go in vain," Singh told a press conference after paying homage to the slain jawans. He said a meeting of all Naxal-hit states will be held on May 8 to look at ways of rooting out Left-wing extremism. "We will review the strategy (of dealing with Naxalites) and if necessary we will revisit it," he said.